UCT researchers’ efforts to determine the role of vitamin C in septic shock patients were rewarded when their poster presentation not only won the research prize from the Critical Care Society of Southern African, but also the equivalent prize from worldwide federation. This means the research presented by Dr Lauren Hill from UCT’s Division of Critical Care was deemed the most important scientific work at this year’s critical care conference. This 11th congress of the World Federation of Societies of Intensive and Critical Care Medicine took place in Durban from 28 August to 1 September. 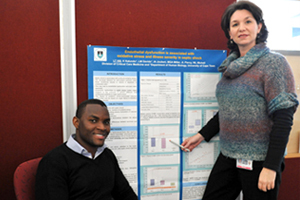 Best of the best: Dr Lauren Hill (right) and Kondwani Katundu with the poster which won the prize for the best research presentation at this year’s critical care conference. The winning poster was scored on presentation and scientific value and received the overall prize for best research presentation at the world congress. 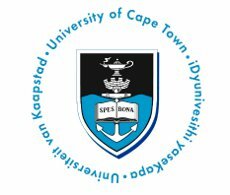 It contained the findings of a baseline study in which Hill and fellow UCT researchers found that oxidative stress is associated with dysfunction of the vascular system in a way that is linked to illness severity. Oxidative stress is the overproduction of cell-damaging molecules under conditions of, for example, low vitamin C status. “The low vitamin C status is not necessarily a nutritional indicator, but is a consequence of septic shock,” says Hill. During septic shock the body becomes overwhelmed by infection, which leads to an inability to maintain blood pressure. Patients with septic shock have a high mortality rate with one in two or three patients dying as a result of it. “We’re particularly interested in the potential of high doses of vitamin C as an adjunct to treatment for patients suffering from septic shock because it’s a relatively cheap intervention, is easy to administer, and seems relatively safe even at high dosage,” adds Hill. Commenting on the accolades, Hill said: “Of course it is good to have one’s work acknowledged by one’s peers like this, as we always try to do research that is relevant.” Collaborators in this study included a Malawian masters student, Kondwani Katundu, as well as several consultants, namely Professor Lance Michell, Dr Malcolm Miller and Dr Jenna Piercy, from UCT/Groote Schuur’s multidisciplinary Intensive Care Unit. Hill also acknowledges the support of her scientific collaborator, Dr Lester Davids from Department of Human Biology, whose antioxidant lab provides technical support for the scientific assays necessary to perform research of this kind. The next phase of the research will take the form of an intervention study to test whether vitamin C is indeed safe and effective as co-therapy in septic shock treatment.